2/21/2014Share this story on Facebook! Making friends can be difficult for anyone, but these eight tips can help you as you head to college. 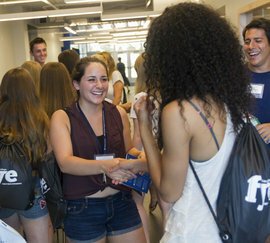 Meet as many students at orientation as you can: I met two of my closest friends during my summer orientation at Ithaca College (one of them became my freshman year roommate). I only kept in touch with half of the people I became acquainted with. But even if you don't hang out with them often, they will definitely introduce you to other friend groups. Before you know it, you’ll have a huge web of connections! It’s not a race: All the “good friends” won’t be taken if you don’t make friends until your second semester or so. It takes everyone a different length of time to find matching interests with another person. However, it’s important to keep in mind that people are more open to meeting new people at the beginning of the year because everyone will be doing it. It can be less awkward to add someone on Facebook or get their number when everyone is just meeting for the first time. Find your niche: It stands to reason that if you’re hiding in your room during your college career (while not in class) you won’t meet many people. Ithaca College has more than 100 clubs and organizations to participate in that will not only have you interacting with other students, but may help with career experience as well. Stay social: Starting college is not the time to decide that you are above social media like Facebook and Twitter. These are useful tools that help people meet and can potentially link you with a job. In your first few weeks you might be adding tons of new names to your friends list, so keep in mind what kind of privacy settings you have up and what your new friends (and potential employers) can see and read. This doesn't mean change yourself for others, mind you, but a profile picture of your face might serve you better than a photo of a cute duck. Find familiar faces: Living in a dorm your first semester? Why not say hello to the person with the similar morning routine? Brushing your teeth and can’t chat? (Or you don’t want to actually speak?) Give them a wave, a nod or a smile. Chances are they might want to know who you are too! Get to know the people in your major: This one is pretty obvious, but if you are seeing the same people in your classes, you might share a major/minor of study with them. What better way to become colleagues, and friends, than by exchanging numbers to talk about assignments? Now you have someone to share ideas with outside of the classroom. Ask an upperclassman: Wish you had an idea of what to do in your major? Want to hear how other students are preparing for the “real world” but don’t want to talk to a professor? Then make friends with an upperclassman who is a year or so ahead of you. You can ask for advice on what classes to take and what organizations to join. You can even join the IC Mentoring Network to get advice from alumni and current students. To conclude, life is not a spectator sport: I know plenty of students who took a year or more to get used to their college environment, but you can’t live life watching it pass you by. Meeting people and getting involved might seem like a scary prospect for some, but it gets easier, and you’re obviously not alone. You don’t have to be friends with everyone in your building, but you should know more than just your roommate’s name. Meeting people with whom you share a common interest, even just a favorite book series or musical group can be the start of a friendship. In college, you live in a close community where your future friends might be just across campus. Take advantage of that, and discover friendships that can last a lifetime.